The 1996 Roy Lichtenstein sculpture Brushstrokes stands prominently outside the Portland Art Museum’s Mark Building. Artwork credit: Roy Lichtenstein, Brushstrokes, 1996, painted aluminum, Gift of Prudence M. Miller and her Family, © Estate of Roy Lichtenstein. 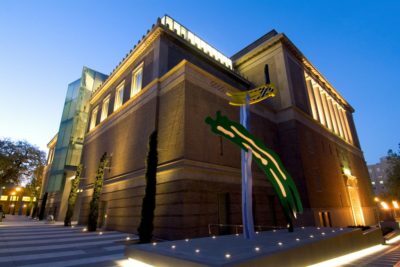 The Portland Art Museum has announced a grant from the 2018 Bank of America Art Conservation Project to conserve Brushstrokes, by Roy Lichtenstein. The grant funding will support essential conservation work to protect the monumental Pop Art sculpture, which stands outside the Museum’s Center for Modern and Contemporary Art. Later in his career Lichtenstein shifted his focus to three-dimensional media; he produced several large scale sculptures for public places, including several based on the Brushstrokes paintings. The work to be conserved in the project is a part of that series. 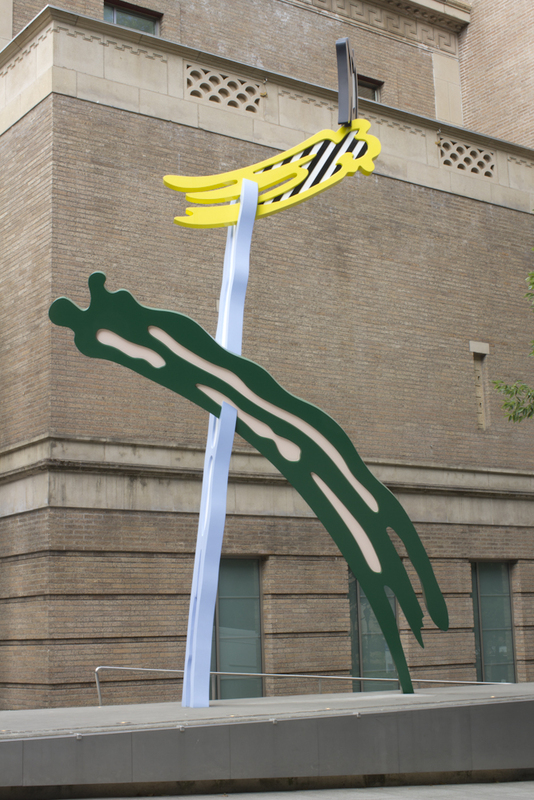 Brushstrokes, a gift from Prudence M. Miller and her family, was installed outside the Portland Art Museum in 2005 to coincide with the opening of the Museum’s Center for Modern and Contemporary Art. It has stood as a beacon announcing the Museum to visitors ever since. Fabricated in 2002, the sculpture’s paint is showing signs of degradation due to continuous exposure. Although steps have been taken to prolong the life of the paint, fading, chalking, thinning, peeling, and increased sensitivity to solvents indicate failure of the coating, resulting in an undesirable appearance. The conservation will be performed by a team under the leadership of Portland Art Museum Conservator Samantha Springer. The treatment will involve ongoing consultation with the Roy Lichtenstein Foundation, hiring a specialized contractor to carry out the work on site, and color measurement of the final paint coating to ensure achievement of the approved standard colors. Onsite work is planned to begin in May or June of 2019, once the weather is consistently dry. Contractors will erect an enclosed scaffolding structure around the work so that conservation can be carried out in as controlled an environment as possible. Once work begins, the conservation treatment should be complete within a month. More information about the project will be available during and after the process on the Museum website and in “s.a.m. @PAM” videos on the Museum’s YouTube channel. month at Portland Art Museum. The Bank of America Art Conservation Project provides grant funding to nonprofit cultural institutions throughout the world to conserve historically or culturally significant works of art that are in danger of deterioration. Since the Art Conservation Project began in 2010, Bank of America has provided grants for more than 150 projects in 31 countries on six continents to conserve paintings, sculptures, archaeological and architectural pieces that are critically important to cultural heritage and the history of art. Twenty-one major art restoration projects across six countries and in 11 U.S. cities are receiving grant funding through the 2018 Bank of America Art Conservation Project. A selection of works in the U.S. benefiting from the 2018 grants includes a twelve-panel screen with Spring Morning in the Han Palaces scene and inscription at Freer|Sackler, Washington, D.C.; The Large Bathers by Paul Cézanne at The Barnes Foundation, Philadelphia; Pan American Unity by Diego Rivera, at San Francisco Museum of Modern Art, San Francisco; and Conservation of VMFA’s Collection of Photographs by the Kamoinge Workshop, at Virginia Museum of Fine Arts, Richmond, Virginia. Learn more about the Portland Art Museum’s conservation projects.